My mom had some strange things in her purse. I think most moms do. And many can relate over the odd items swimming around in their handbags. A child’s sock. A toy car. A sticky, leftover snack your toddler didn’t finish…a week ago. Usual mom stuff. My mom was different though. There were odd items that were intentionally there so that she’d have them if the situation arose in which she may need – or shall I say, want – them. One of those items was a little bottle of cherry grenadine. My mom loved diet cherry coke. But not the kind sold by the Coca-Cola company, the kind you make by adding just the right amount of grenadine to your soda. A meal at a restaurant just wouldn’t be the same if she had to…gasp!…drink plain diet Coke. So, there in her purse sat a little bottle waiting to transform her drink if we stopped to grab a bite while we were out. And we always stopped to grab a bite while we were out. For some people, there are certain small pleasures in life that aren’t worth missing. Perhaps it takes a certain sweetener to make your sweet tea just right. Or maybe you’re traveling and can’t imagine a morning without your specific brand of black or green tea. You might be trying to watch your weight and want to be sure you have your artificial sweetener with you next time you dine out. If you’re looking for the perfect sugar packet holder for your purse, or you want a travel tea bag case for your next trip, you’ll love Kyle’s personalized metal sweetener cases. 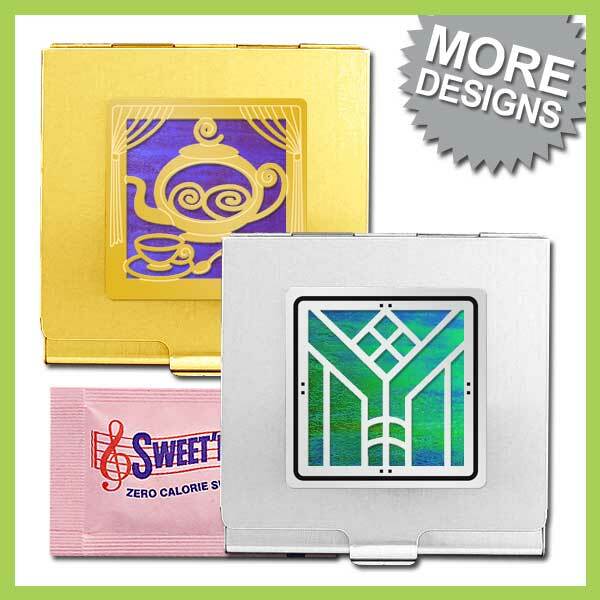 For carrying just a few sugar packets in a nice, compact case, you’ll want to order her slim sugar packet holder (shown below). It comes in gold or silver and you can choose from over 500 of Kyle’s cute designs. You can also add your favorite iridescent accent color and customize it with an engraving. This case comes in a thin or deep version. About 3 packets fit in the thin one and 5 fit into the deep case. To carry a larger capacity of sugar packets or to travel with your tea bags, customize a travel tea bag case. 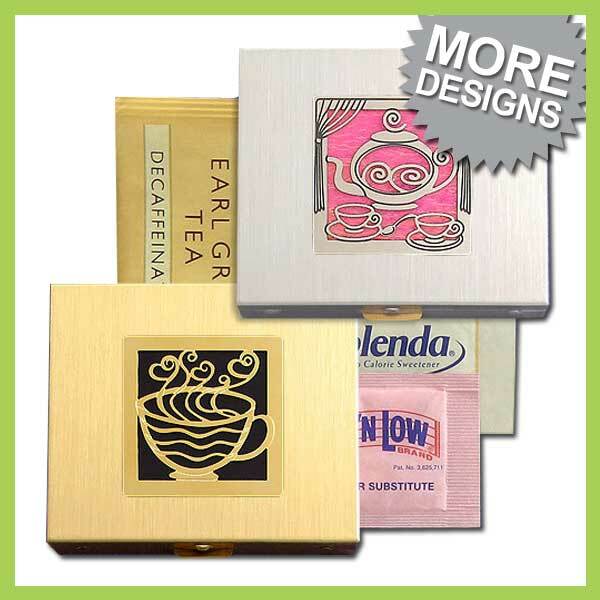 These metal boxes offer a sturdy way to protect your tea and sugar packets on the go. Get one with Kyle’s decorative tea pot or coffee cup design (shown below), or choose from hundreds of other creative etchings. Whatever small items you’re looking to carry in your purse, keep them protected and easily accessible with a stylish metal case that’s custom made just for you. This may not have worked for my mom’s grenadine, but I can’t go away overnight without my bags of Lipton cold-brew tea, so this case is perfect for me. Shop unique gifts at Kyle Design, where every gift is handcrafted in the design and color of your choice. I’m absolutely loving this nurse’s quote by Rawsi Williams. I know so many hard-working nurses so I love that there’s a whole week that celebrates the men and women who have worked so hard to be where they’re at today. Every year I make an effort to make my favorite nurses feel special on Nurse’s Day, which is May 6th. I love to send my sister-in-law an engraved RN keychain or vintage nurse hat badge reel. My cousin adores the personalized nursing swag I send her way too. The truth is, everyone loves to feel special. Nurses spend so much of their day caring for other people’s needs and so little time caring for their own. It doesn’t take much effort to honor a nurse, but it will absolutely make their day. Shop unique nurse gifts at Kyle Design to customize an affordable gift for a special nurse in your life. They say it’s better to give than to receive – experience the feel-good that comes from making someone else feel special. It’ll probably outlast Nurse’s Day for you. But for the nurse you honor, that feel-good won’t wear off for at least a week.